Bored of shooting the same location? Here is how to get over it! Are you bored of shooting in the same location every day? Here is how to get over it! If you are a long time Reader of StreetHunters.net, you might probably know by now that both my partner in crime, Andrew Sweigart and myself live in very little towns that tend to be quiet most of the time, especially during the winter season. Andrew lives in York. He has written about shooting Street in York, Lancaster, Harrisburg or Baltimore in his post My Favorite Places To Shoot Street Photography. I recommend you take a look at Andrew’s post for some tips if you leave in one of those areas. I live in Crete. 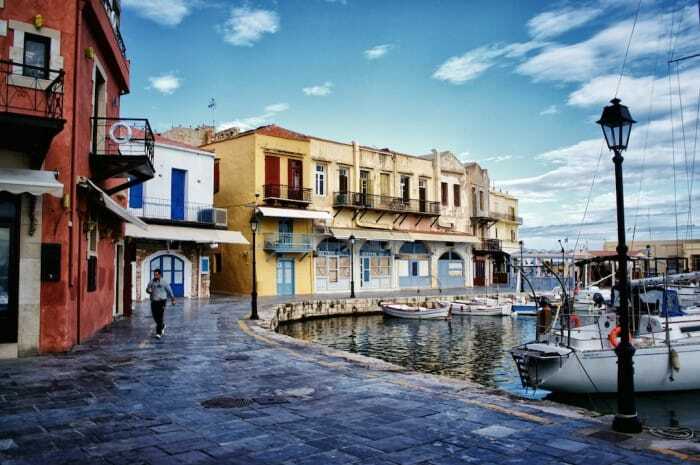 Crete has 2 major cities and 2 big towns. There are other small towns and mostly villages on the island. I live in Rethymno. Rethymno is a big town. During the summer season my town is full of tourists so there are many opportunities for capturing new photographs. During winter, things are not so vibrant. 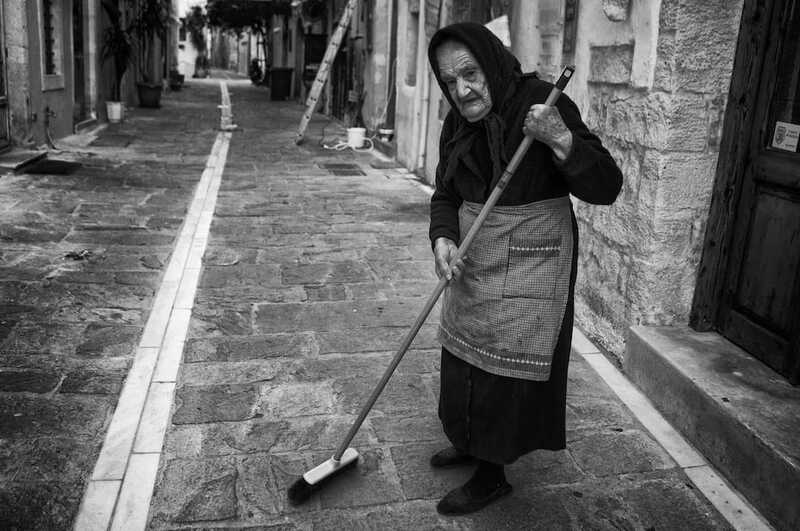 If you check my post A guide to Street Photography in Rethymno, Crete you will notice that the best part of town to shoot is the Old Venetian town and that is but a small part of the greater Rethymno area. That is where I shoot on a daily basis. I can walk from one side of the old town to the other and back in 1 hour. I have taken more than 20.000 photographs here in the past 3 years and I keep shooting. Even though I have published 367 photos on flickr (at the time of this post) I still feel that my little town has a lot of new photographic opportunities to offer me. I have felt myself suffocate here photographically. I have felt myself wither and fade into boredom. I have also thought of never, ever taking another photograph when in Rethymno, but those thoughts are all in the past now. I have found ways to get over the feeling of being bored and I want to share how with you all. This is a classic remedy for boredom. Change your POV to see the streets of your home town from another perspective. Start shooting “Rat’s eye view” shots or find ways to climb onto higher places and take shoots that you would normally not. You will start seeing your town in a different way, noticing things you hadn’t noticed before. By trying another lens you change your point of view and see things through different eyes. So, for example, if you have been shooting your streets with a 50mm (equivalent) lens, try something wider. 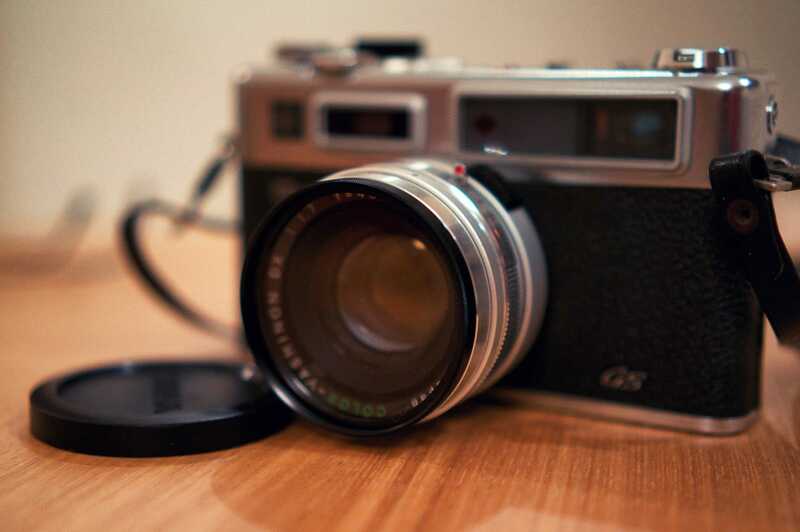 A 35mm (equivalent) lens will give you a wider view and force you to get closer and shoot more dramatic photos. When I tried switching from digital to film I found that it regenerated my interest for my home town in a matter of minutes. The reason is that I was “forced” to use the camera in my hands in a more practical way, it slowed me down, making me think before each shot. This was a completely different experience to the fast paced action street photography I was used to with my digital camera. I recommend you do the same, you will find yourself feeling rejuvenated and interested in your town’s streets once more. This photo has been shot by StreetHunters.net Reader and good friend of mine, Dan Berntsson, a.k.a. The Big Swede. 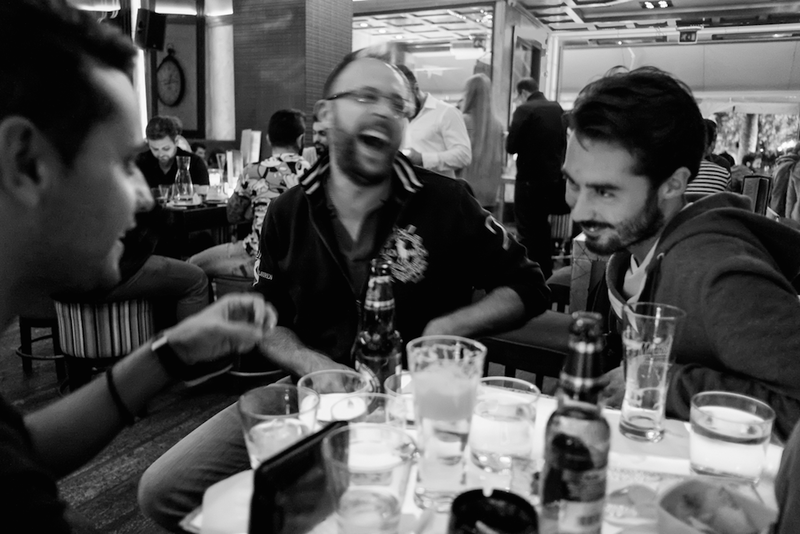 From left to right is Yannis Fragkakis, me and Digby Fullam. I find that when I am out shooting with friends I experience my town’s streets through their eyes. This is very refreshing and also enlightening. They seem to see things I don’t and I see things they don’t so by exchanging ideas, we all broaden our perception and understanding of our home town. Also, friends really help to get me into the right mood for a good Street Hunt. Look at me here! Ready to take on anything and anyone! 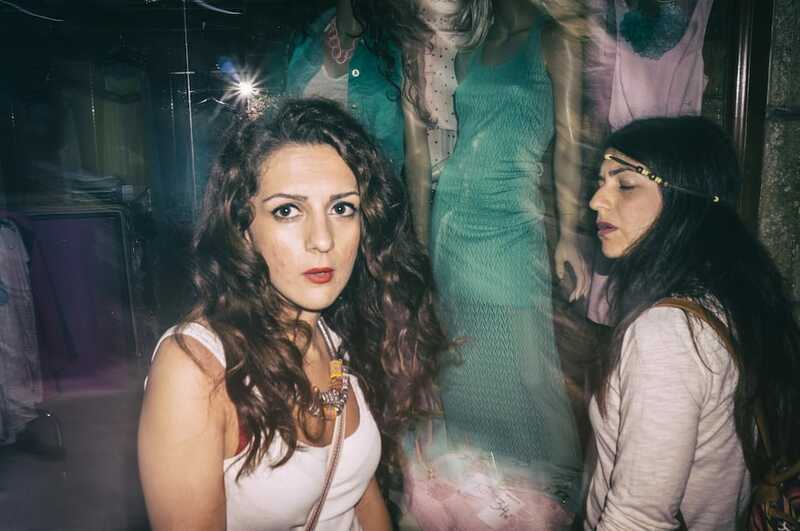 Get others hooked on Street Photography, start a group. If your friends are not Street Hunters or if your Street Hunter friends live in other parts of the world, then start getting your local pals hooked on the art. Take them out on Street Hunts with you, one at a time and let them take a couple of shots. 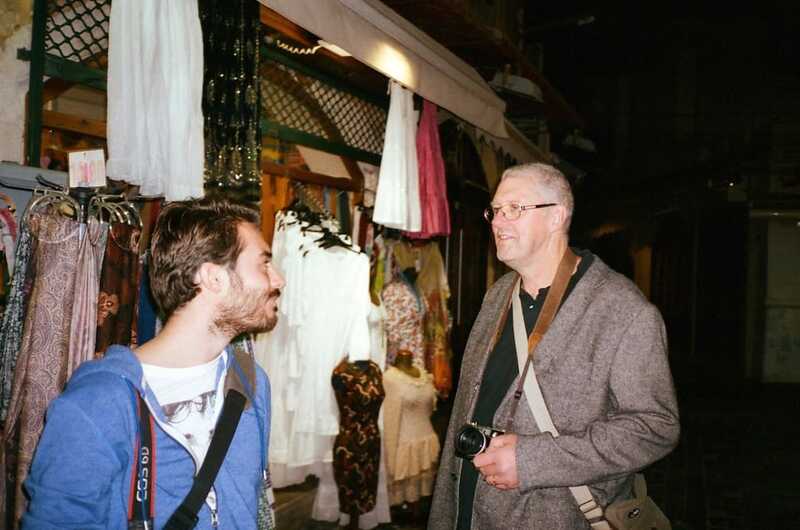 Explain what Street Photography makes you feel, let them experience it for themselves. Being your friends, they will probably like what you like. You never know. You might start your own group of Street Hunters and go shooting with them! Ask your friends to challenge you and you do the same to them. 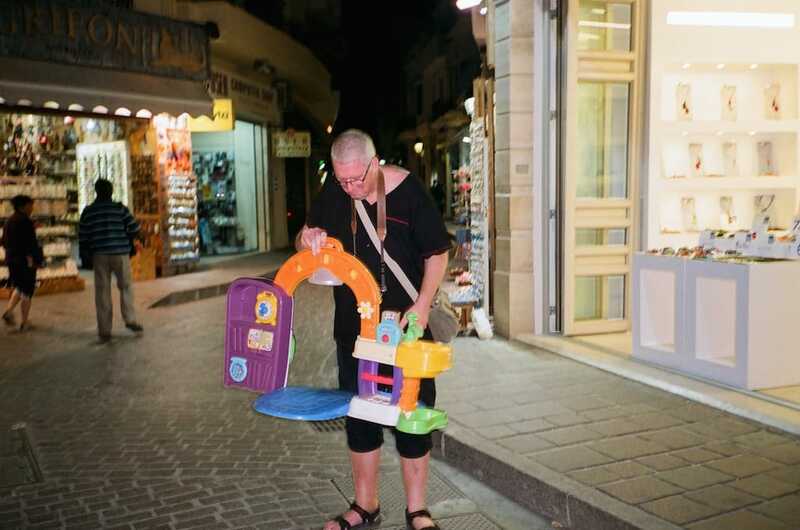 Dan Berntsson being challenged to carry a toy kitchenette all over Rethymno and shoot street photography at the same time! Now that you have your local group setup, discuss ways that you can challenge each other. Do things that you have never done before. For example a friend could challenge you to shoot in B&W for a month and you could challenge your friend to shoot from a “Rat’s eye view” only for one week. Try different things out, have fun brainstorming over new ideas and putting them to the test. I have never done this, but I am definitely going to start one day. There is this street in my home town that is always busy that I find very interesting. I will mark a spot and visit it every day for a year and shoot the same view over and over again. Then I can make a video presentation or a comparison and see which days were the most interesting and why. Mind you, this task needs you to commit to it, to get any results. All modern cameras have automation. Getting a perfect exposure is not even a challenge anymore now that camera have rapid fast calculative powers. You can switch your digital camera to P mode, point it to a person walking down the street, and make perfectly exposed shots, in focus, of that person while walking out of the shadow, into the sun, without worrying about light. Switch your camera to fully manual control and try doing that again. See how you can handle yourself without automations. Learn how to really use your gear and any gear for that matter, because if you can use one camera in manual mode, you can use them all. 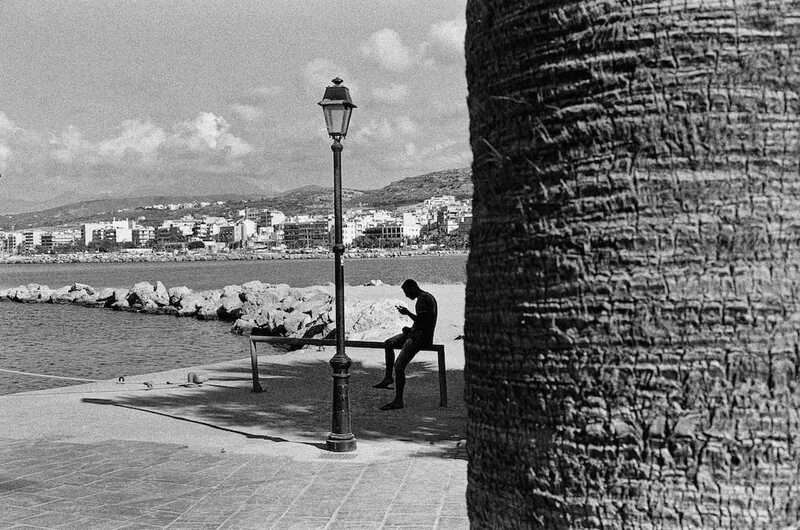 Challenge yourself by starting a Street Photography Project. I recently wrote a post containing 45 Street Photography Project ideas. Jump into that post, give it a look and pick one of the projects that makes you tick and do it! You will find new challenges to face and your home town will become interesting for you, once again! Challenge yourself by using One Camera & One Lens for a specific period of time. When using One Camera & One Lens, you manage to understand your camera better, amongst other things. I mention the benefits of this practice in my post Why is One Camera & One (Prime) Lens good for Street Photography? You should check that out if you haven’t already. Try shooting with a different style. In an older post I wrote called The Types of Street Photography I mentioned the different kinds of Street Photography people tend to do. These types of course aren’t carved in stone, but you will get an idea of some of the different ways in which Street Photography can be performed. By the way, what style of Street do you have? Have you determined your style? How about changing that style for a short period of time? 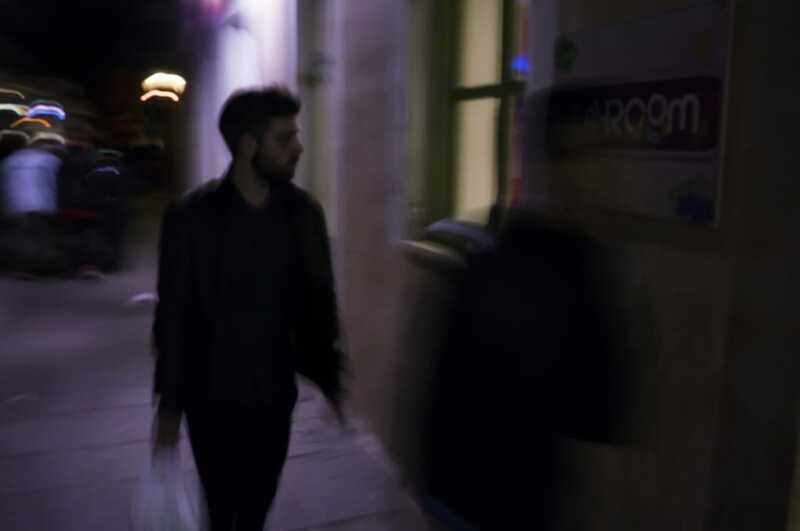 Have you ever tried intrusive Street Photography with a flash? You might find it interesting. Split your town into regions. This is another thing I like doing when I get bored. I restrict myself by splitting my town into regions and then visiting each region on specific days of the week. So for example I will visit the same region of my town every Saturday, because I know that is where and when all the action is. I will not visit that region on any other day though. I will visit different regions on different days. This practice restricts me and makes me eager to visit the next part of town the following day. Learn the best time of day for the best light in each and every part of town. 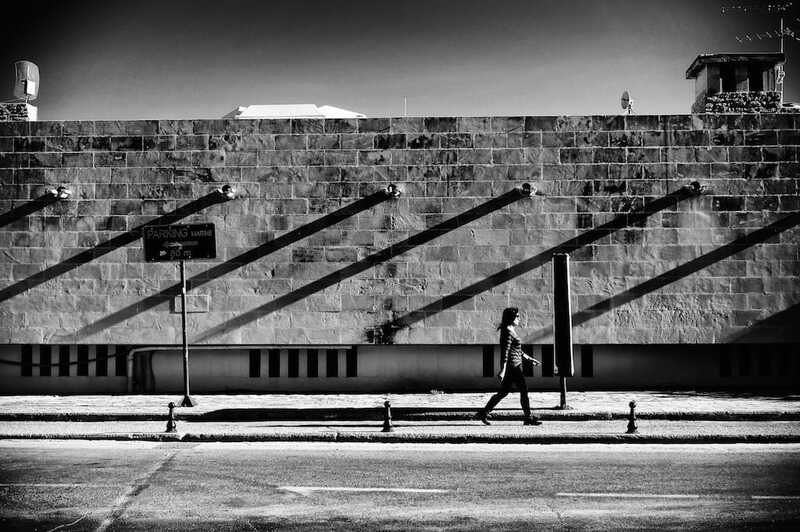 There is a wall in my town of Rethymno that looks like parallel lines are shaped on it by long shadows when the sun is in a certain position, during a certain month at a certain time. So, for example the photo you can see here called “Parallels” can only be shot during a specific time of day on one month of the year, if the sun is out. Learn which places in your town have similar peculiarities with light and shadow, take note of them and then take advantage of them. Think of yourself as your town’s documentarist. Document change & people. “Pasha” shot by Spyros Papaspyropoulos in Rethymno, Crete. 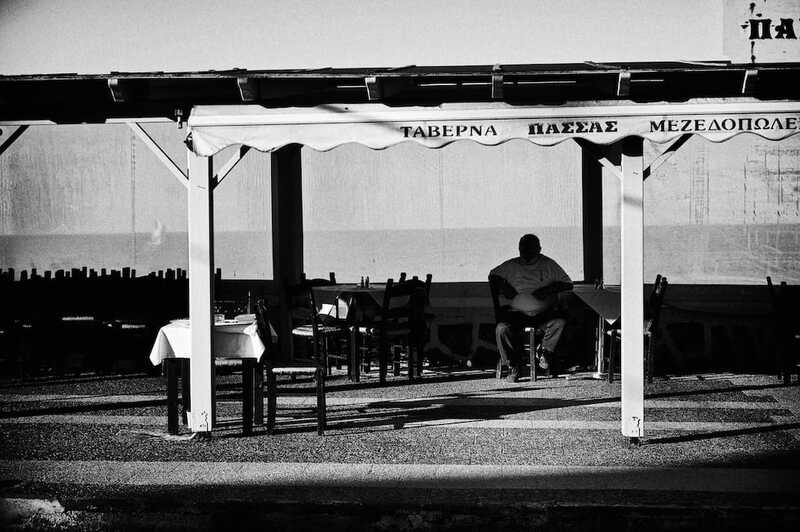 This taverna no longer exists. 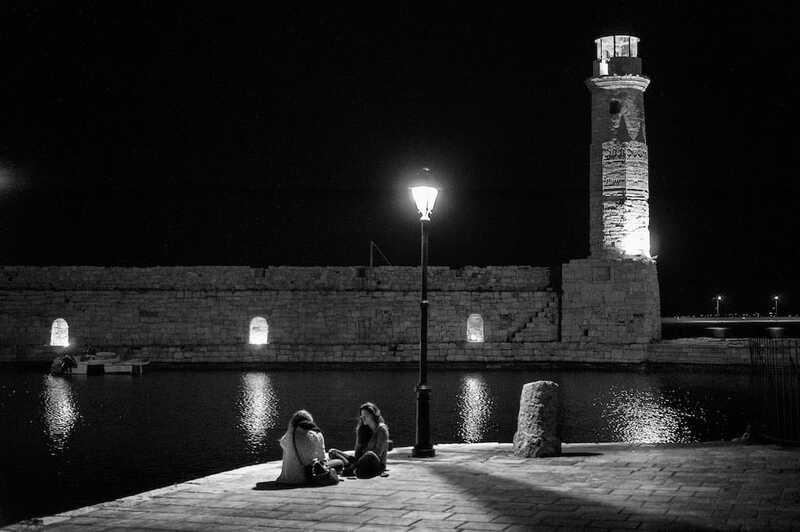 It is a part of Rethymno history. To shoot the same location, day in day out is in my opinion a privilege that most people just don’t understand. People in our position are truly lucky, because we get the chance to document the life of our town and see all the changes that occur as time flies by. I have photos of people that are no longer of this world. I have photos of places that existed for tens of years and are now history. I have all these interesting photos that show the change and evolution of my town. This is priceless and very interesting. Keep on shooting in the same streets, for as long as your feet can carry you. Your photos will become part of your town’s history. Try to walk your streets during times you normally wouldn’t. I love doing this when I have the chance. Especially during the summer months, when the nights are warm and the streets are usually busy with tourists and locals hopping from one bar to another, I like taking photo walks at 3 or 4 am and taking photos of situations that I would normally not. I like taking photos of places that look completely different in the morning. It feels like looking at my town through a magic glass and seeing a twisted version of it. Leave your camera at home for a week or until you miss it terribly. The last solution to boredom is a drastic one but believe me it works, 100% guaranteed. For one week don’t touch your camera. Don’t take it with you. Leave it at home. But don’t leave it lying around. Store it, out of sight so you can’t see it. Better yet, ask your spouse, roommate, girlfriend, boyfriend to hide it for you so you can’t use it no matter what. Be camera free for a week and see what happens. The first day you might not miss it, but you will certainly start “seeing” missed opportunities. The second day you will feel that you are missing more and more opportunities and you will start wanting your camera. As the days go by you will feel your need to photograph grow and grow until after 7 days when you get your camera back you will just feel so happy you will hit the streets for hours! If one week doesn’t do this for you, hide your camera for a month. One more thing that is worth noting is that during your absence you will not be the only one that will change back to a thirsty Street Photographer craving for new images, but your town will have changed. Someone new might have moved into your neighbourhood, a new shop might have opened around the corner, or a building might have been demolished. 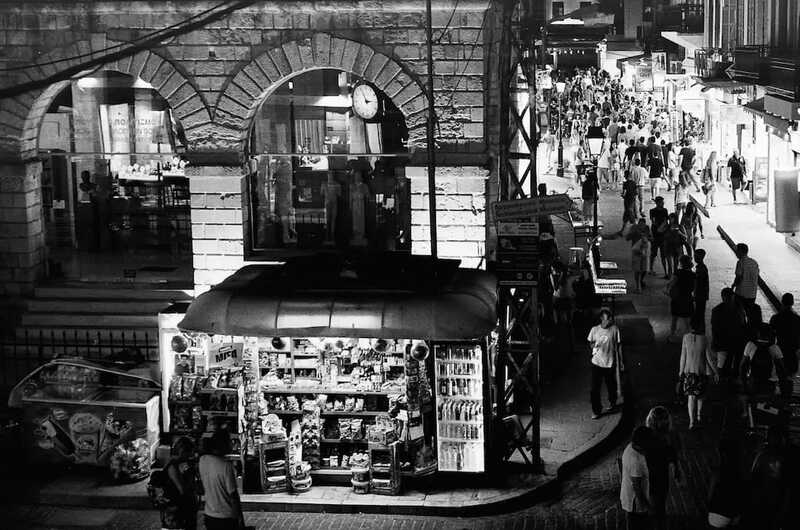 Towns and cities are living organisms, they change every hour, every minute, every second. 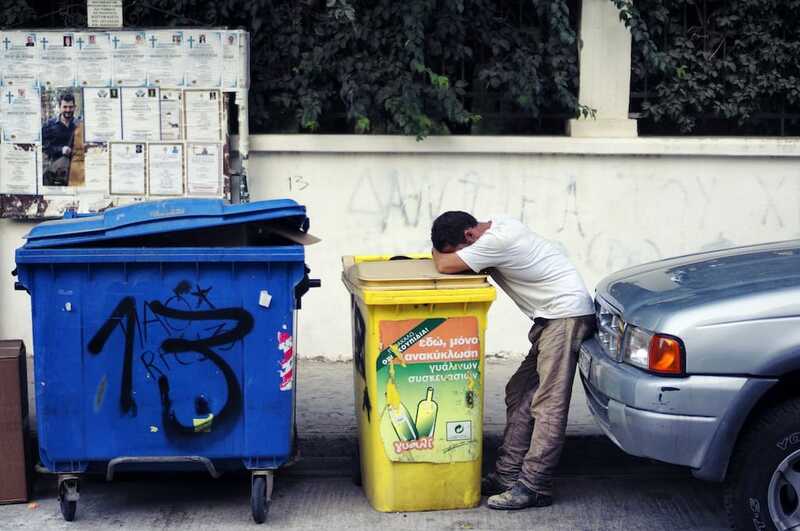 “Wrecked” shot by Spyros Papaspyropoulos in Rethymno, Crete. This shot was taken 20 paces from my front door the 1st minute I exited my home to go Street Hunting. There is a photo everywhere. So as you see there are tons of things you can try out in order to get re-inspired with your town or neighbourhood again. Look at things differently. You might see something new, something that you never saw before. We are all humans and we humans tend to get bored of repeating the same things over and over again, so we try to find ways in our minds to make the mundane feel interesting once more. If you don’t have your own way to do this, I hope that one of the aforementioned tips will help you. If bored and feeling uninterested then imagine yourself as a tourist and see the mundane everyday stuff as being foreign. Works for me. Hello A Almulla. Thank you for sharing your experience. That is a great tip! Interesting post, with useful, usable tips as always Spyros. I’ve just got back from a family holiday, and haven’t used a film camera for about 12 days. 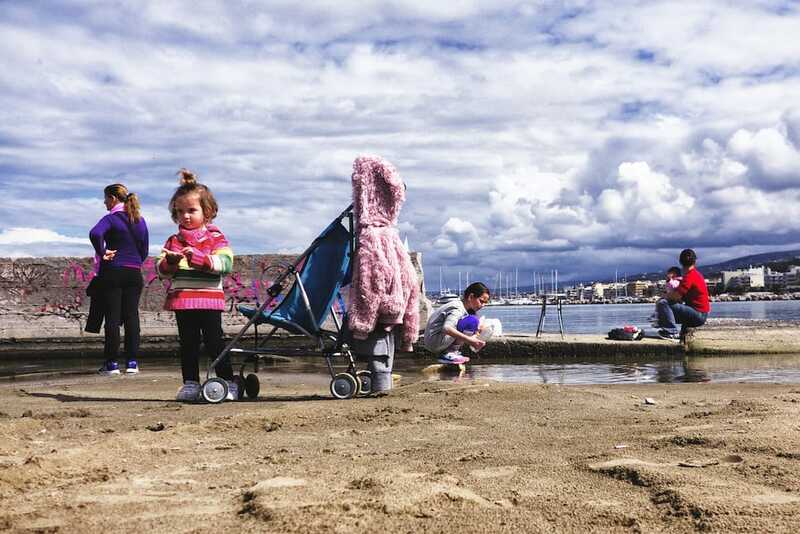 I did use my compact digital on holiday, which I use for most family “snapshots” anyway. I’m not yet desperate to return to my film cameras, but the urge is growing slowly. I think it’s good to have a break from our passions, to help is realise how much we love them, and to not take them for granted. I’m going to follow this abstinence with another of your suggestions – one camera, one lens. Sort of. I’ve recently been through a phase of buying/testing a number of different cameras and have kind if burned out on them. So I want to return to something I did about four months ago – shoot a whole month with just one camera. Back then, it was my Yashica Electro 35GTN. This time I think I’ll use a relatively new (to me) camera, but one potentially as capable as the Yashica, an Olympus 35RC. I have also just bought something I’ve been after for a long time, an Olympus Pen EE-S half frame, after falling in love with their diminutive size and style at a recent camera fair. I hope to experiment with some diptychs and triptychs which I think can work really well in the street. Plus I’m hoping this camera will complement its slightly more advanced and manual big brother, the 35RC, and they’ll make a formidable and focused double act. Keep posting, you inspire us all! Hello Dan! Thank you for commenting! I was wondering where you had been the past couple of weeks. I am glad that you found the post interesting. I try and write things from my experience, as they happen to me so when I get such positive feedback it feels very rewarding. I was reading about your One Camera One Lens plan and the combo of the Olys. I think it will be a good thing to try. I am sure you will have loads of fun. I have now been shooting 4 weeks straight on film only. No digital. As I mentioned to you in an other conversation we had, I have given away my NEX. Not far, it is still in the house, but it now belongs to my wife 🙂 I am trying to manage without any digital camera. I miss it, but knowing that it is close by comforts me. I currently am shooting with a Canonet QL17. An amazing little rangefinder with fantastic glass. As a second, I have my Olympus mju II always in my pocket. I have it mostly for when I am not out street shooting, but for when I am out doing something else and I suddenly spot something I have to photograph. That said, I will be very interested to know how your plan works out and to see some photos! Make sure to keep me posted! Spyros, I think it’s always a great idea to write from our own experience, people connect with it far better. Four weeks without digital is exciting, and it sounds like you’re having a blast. I keep thinking about dusting off my NEX for some autumn shots, using the Olympus OM Zuiko lenses… But it hasn’t happened yet. Film is just too enjoyable. I’ve read good things about the Canonets, glad you’re enjoying. It was something I considered before getting the Olympus 35RC, as well as a Mamiya 7II or a Hi-Matic, but the Oly was the one that seem to draw me in most. I’m glad I went with it, it feels like a very special camera. The mju ii is made exactly for that spontaneous always ready kind of shooting. I’m definitely moving away from larger cameras like the Yashica Electro, hence the 35RC and incoming Pen EES, they’re both about half the size and bulk! Will keep you posted of course. I have a question. 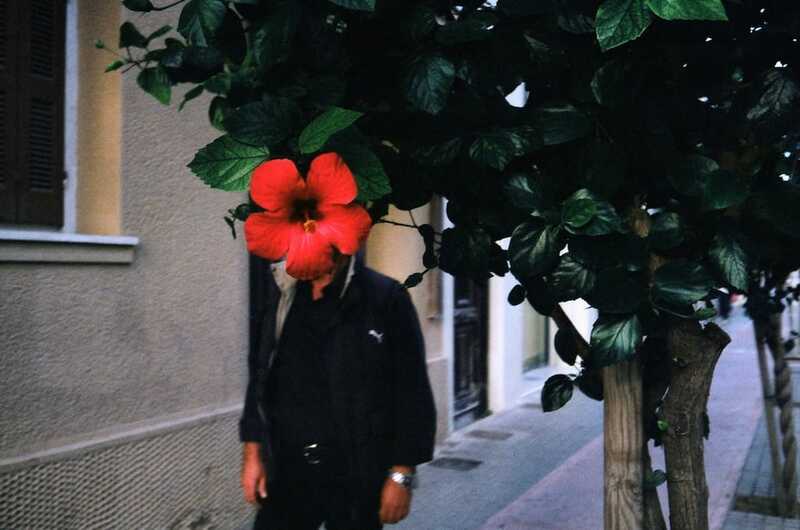 Do you find your street photography changes in different seasons? I was wondering if you take more people shots in the warmer months where there are more people around, then maybe focus more on street furniture, architecture and textures and geometry in quieter, colder months, for example? Good morning Dan and sorry for the late reply. The Canonet is small. It is much smaller than the Yashica GTN. 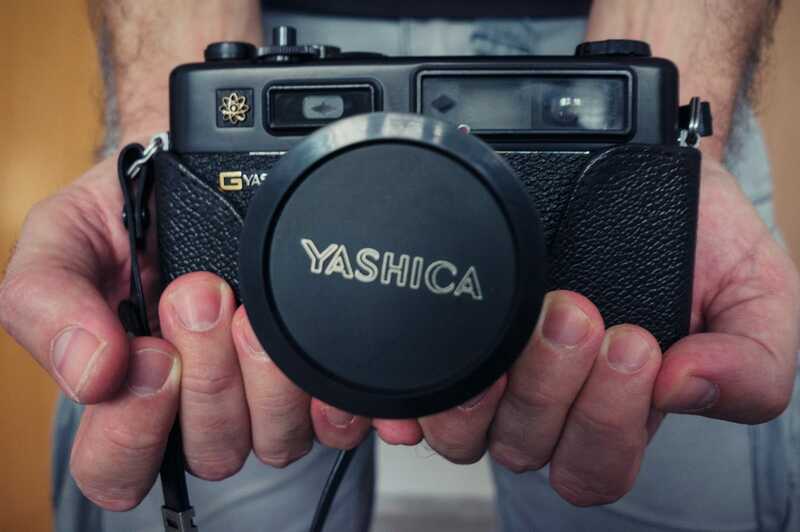 About the same size as the Yashica CC I would say with a lovely, lovely piece of glass. Also it is nearly soundless. It is by far the quietest film camera I have ever used and it has the added bonus of having full manual controls and a handy Quick Loader system. I like it a lot! As for your question, yes, I do find my photography changes according to seasons. Rethymno feels like a ghost town in winter so I tend to slip back into my B&W mode and search for singular figures in the streets and that sort of thing. I always find a new toy helps with the boredom. I will definitely try that out sometime Edward. It sounds like a handy solution to getting photos all through the day. Excellent article Spyros and very useful tips. After all photography it’s all about experimentation. Thank you for your comment Yiannis! Glad you found the post useful! 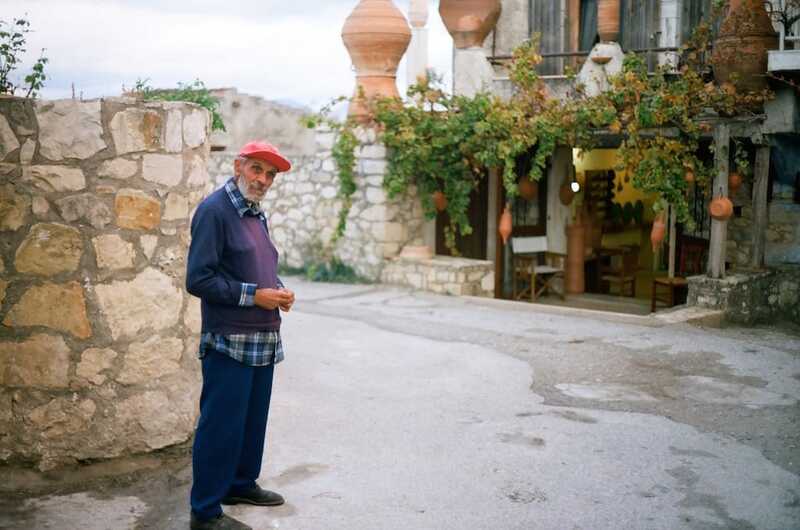 In Italian there’s only one word to define Spyros from Rethymno: GRANDE!